An impressive living wall has been installed on a new £8m 667 space multi-storey car park at Lister Hospital in Stevenage. The car park has been developed with sustainability and energy efficiency at its heart and also features a silent wind turbine and charging points for electric cars. The Mobilane WallPanel living wall installed by Hedera Screens of Derbyshire faces the hospital. Water supply to the wall is monitored and controlled by computer to increase or decrease the amount of water needed as required. 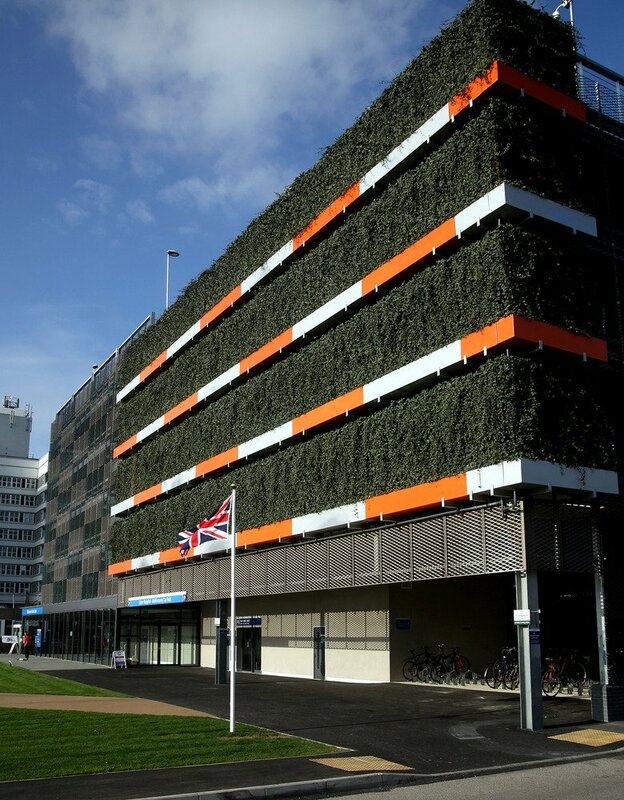 In total, 36 individual WallPlanter modules have been used, each measuring 3.9m wide by 2.9m tall. The plant used is Hedera Helix Woerner, a long-lived ivy which provides evergreen foliage for many years. The entire installation took just a week to complete. Developed in 2002, the WallPlanter living wall system offers designers a robust solution to the greening of exterior walls. WallPlanter units take over two and a half years to grow before they are ready to install. The units are then installed against a façade of a new or existing building. The system has proved itself with numerous large installations in place for up to seven years without the need for any replanting. The wall at Lister Hospital requires minimal maintenance and trimming just once a year.